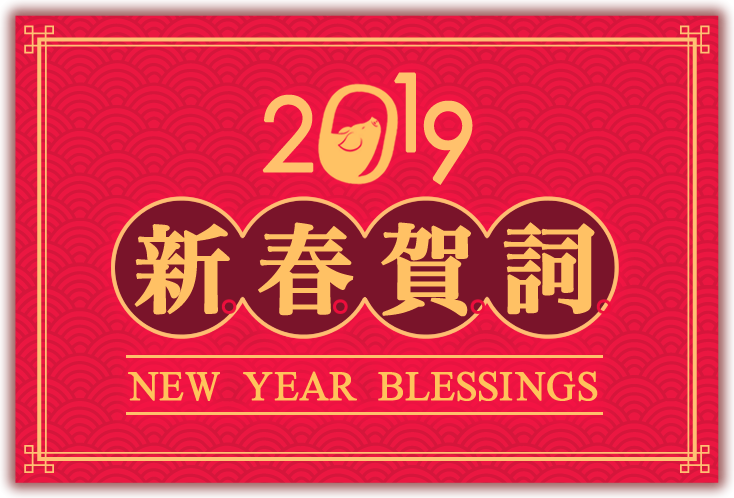 “In every home a new day dawns; old peach wood charms are replaced anew.” 2019 is the Year of the Pig. Of the twelve zodiac signs, the pig symbolizes a way to round up the year and start a new beginning of life. For this year’s One-Stroke Calligraphy spring couplet, Venerable Master Hsing Yun writes “Always Well-rounded and Auspicious,” wishing everyone perfect ease in body and mind. Under the care of his Kaohsiung Chang Gung Memorial Hospital medical team, Venerable Master has recovered well from his craniotomy two years ago. At 92 years old, Venerable Master says, “I am not in pain, nor am I sick. I am only slightly inconvenienced.” Concerned about Cross-Strait peace and the development of Humanistic Buddhism, Venerable Master says, “I need to work harder.” As it is rare to encounter the Buddha’s teachings and have such a great Dharma teacher, both monastic and lay disciples should strive vigorously to follow in Venerable Master’s footsteps of propagating Humanistic Buddhism. As a part of his recovery, Venerable Master continues to write One-Stroke Calligraphy to build affinities and support outstanding but underprivileged students in the Seeds of Hope Program. His “One-Stroke Calligraphy: Post-Recovery Works” is exhibited at the Light Transmission Building in Fo Guang Shan Headquarters, Tianlong Temple in Nanjing, and Liyang Museum. It is hoped that many will show their support in changing the lives of students from the remote areas of Taiwan, India, Philippines, Brazil, and South Africa through education, so they may become future leaders of society and their countries. As art and culture have no boundaries, Venerable Master has used literature to promote Buddhism throughout his life. This is evident from the stone inscriptions of Venerable Master’s One-Stroke Calligraphy at the Sutra Repository, which convey the essence of Humanistic Buddhism. Former President Ma Ying-Jeou praised during his visit, “Venerable Master Hsing Yun’s One-Stroke Calligraphy is the best interpretation of modern Buddhist scripture.” Moreover, the Sutra Repository also holds “One-Stroke Calligraphy―A Meeting of Dharma” on a regular basis, receiving devotees from all walks of life. Cultural, educational, and artistic Dharma propagation endeavors have flourished at the FGS Buddha Museum under the united effort of Director Venerable Ru Chang and Deputy Directors Ven. Yi Run, Ven. Yung Rong, Ven. Yung Jun, Ven. Ru Yuan, and Ven. You Xian. In January, representatives of the Buddha Museum met with the British Library in London to discuss collaborative plans on a digital database of the Fo Guang Buddhist Canon and the Encyclopedia of Buddhist Arts, as well as exhibition exchanges. In March, Venerable Master Hsing Yun’s One-Stroke Calligraphy Exhibition was held at the European Parliament in Brussels. Former Prime Minister of Slovenia, Lojze Peterle, and Hungary EU Representative Adam Kosa, participated in the opening ceremony. Fraser Cameron, director of EU-Asia Centre in Belgium, praised that Humanistic Buddhism, as propagated by Venerable Master, aligns with the European Parliament’s emphasis on peace and harmony. In May, the Buddha Museum co-organized the “Walking with the Buddha: Discovering the Natal Landscape of the Buddha Exhibition” with Durham University and the Oriental Museum from the UK. The exhibition concerns the latest archaeological findings at Lumbini Garden, the birthplace of the Buddha. An international academic conference was also held, attended by archaeologists from several countries. As music is highlighted by Venerable Master as a skillful means to propagate the Dharma, Buddha Museum invited the Jiangsu Performing Arts Group to perform the opera Eastward Sea Voyage of Jianzhen. Likewise, Siddhartha: The Musical from the Philippines, toured the United States, performing in various cities including New York. The propagation of Dharma through music has enhanced exchanges between the Cross-Strait as well as the East and West. The Three Acts of Goodness Campaign is in its 20th year. Venerable Master encourages Fo Guang members to spread joy, peace, and auspiciousness to the world, building a society on the Three Acts of Goodness. With the efforts of Guang Ming College President Dr. Helena Correa, Ven. Yung Guang and Ven. Miao Jing, the Three Acts of Goodness Campaign has been promoted in over a hundred schools in the Philippines. Moreover, Guang Ming College celebrated its inaugural graduation of 27 students, who will now begin a new chapter in their lives. The combined efforts of Nan Tien Institute President, Dr. Bill Lovegrove, Ven. Man Ko, Ven. Jue Fang, and Ven. Jue Wei has enabled Nan Tien Institute to offer a graduate program on Applied Buddhist Studies as well as a graduate certificate program in Humanistic Buddhism, both accredited by the Department of Education in Australia. Humanistic Buddhism is now officially included as part of the Australian education system, a new beginning in higher education worldwide. Additionally, Nanhua University was awarded the National Sustainable Development Award, the highest honor of all development quality awards. Furthermore, University of the West’s new President Otto Chang joined the Fo Guang Shan education team. There is no time to lose when it comes to fostering talent. Apart from the FGS Institute of Humanistic Buddhism, Nan Tien Institute, Chinese University of Hong Kong, University of the West in USA, Nanhua University, and Fo Guang University have all respectively established a center devoted to the research on Humanistic Buddhism under Venerable Tzu Hui’s guidance in propagating the Dharma through international academia. The Short-Term Monastic Study Program held in the Sutra Repository offers a chance for all monastic disciples serving in different parts of the world to return to the monastery to further their understanding of Humanistic Buddhism. Youth Buddhist Academies established in branch temples globally, as well as the Dajue Cultural Training Program, have strengthened the number of talented young students entering Fo Guang Shan Tsung Lin University. Likewise, the 16 Buddhist colleges worldwide are also tireless in their efforts of fostering talents. Full of gratitude for the Buddha’s kindness, Venerable Master previously travelled eight times to India with the wish of reviving Buddhism there. Under the efforts of Ven. Hui Xian and Ng Chin Poh Jiaoshi (a layman who lives the monastic life), nearly a hundred novices from FGS Cultural and Educational Center at New Delhi have excelled and are now furthering their studies. For example, Cheng Guang and Cheng Jie are currently at Nanjing University; Cheng Ti, Cheng Liang, and Cheng Jia are at Fo Guang University; Cheng Fa, Cheng Fu, and Cheng Pu are at Mahachulalongkornrajavidyalaya University in Thailand. Furthermore, students from FGS Institute of Buddhist Studies in Bodhgaya have brought the Three Acts of Goodness to Indian society through the Under the Big Tree program with the guidance of Ven. Miao Xuan, receiving recognition from the local people. With Venerable Master’s encouragement, Ven. Jue Cheng led Fo Guang members in founding the Fo Guang Hope Village and held a refuge ceremony in Chennai, India, with the aim of bettering the villagers’ lives. Three Acts of Goodness Schools were also founded in Sri Lanka, Darjeeling, India, and Nepal, providing education for youth as well as a catalyst for transforming their lives. Bodhi seeds planted through the words of prajna wisdom can take root, blossom, and bear fruit everywhere, bringing soothing fragrance and cool breeze to this burning and irritable world. In mid-November, Fo Guang Shan Ancestral Temple―Dajue Temple’s Yunhu Academy held a Humanistic Buddhism Sutra Study Program. Through reading Venerable Master’s True Meaning of the Dharma, students are guided to understand the original intents of the Buddha, which are: inspiration, education, assistance, and joy. New definitions are given to Buddhist concepts from a positive and auspicious point of view. The Complete Works of Venerable Master Hsing Yun, published in 2016, now has an app in traditional Chinese, a creative collaboration between Ven. Man Kuan from Fo Guang Cultural Enterprise and Ven. Hui Zhao from the FGS Information System Center. Venerable Master compassionately directed that it be free of charge, hoping the Dharma water of Humanistic Buddhism will nourish people’s hearts. More elating was the launch of the Complete Works of Venerable Master Hsing Yun and its forum in the UK’s Westminster Parliament. Concurrently, Venerable Master Hsing Yun’s One-Stroke Calligraphy Exhibition and the Buddha’s Birthday Celebration were also held in the Parliament. The Palace of Westminster Chairperson officially announced FGS London as the first Buddhist partner of the UK Parliament Education Team. The following translations of Venerable Master’s works have been published: The Path to Enlightenment in Portuguese (O Caminho para a Iluminação); Star and Cloud: Venerable Master Hsing Yun comic book in Japanese (人間仏教の行 者); and Pearls of Wisdom: Prayers for Engaged Living in Korean (부처님 광명 기원문). Moreover, Ven. Miao Guang and her team at the FGS Institute of Humanistic Buddhism Center of International Affairs have collected terminology specific to Humanistic Buddhism and completed The Glossary of Humanistic Buddhism. They have also held workshops for English Dharma propagators in North America, accelerating the process of localization. Co-organized by the Buddha Museum and the FGS Institute of Humanistic Buddhism, the “2018 When Buddha Meets the Gods Event Academic Conference” and “Chunghua Federation of Traditional Religious Associations Leadership Training Seminar” was attended by experts and scholars from the Cross-Straits and the Philippines, presenting research gathered from the When Buddha Meets the Gods Events held over the past seven years. Scholars heartily agreed on Venerable Master’s notion of naming folk religions, some dating over 2,000 years old, as Chunghua (Chinese) traditional religions. Three years ago, Venerable Master initiated the Chunghua Federation of Traditional Religious Associations, with Wang Jin-Pyng as President and Chen Chia-Lung as Secretary-General as a platform for interfaith and interreligious exchange. As Venerable Master said, “Religions should strive for mutual understanding, but it is not necessary to seek conformity amongst differences. Every god and deity is a light, each shining without hindering the other.” As each religion shines in different corners of the earth, they all bring light to the human world. The fourth phase of the construction of FGS Ancestral Temple―Dajue Temple at Yixing, led by Ven. Miao Shi and Ven. Miao Sheng, is drawing to an end, welcoming all to visit. Moreover, to provide quality lodging for temple staff, the Auspicious Building was completed in November by Ven. Hui Zhi, appointed by Venerable Master to oversee construction projects. Likewise, Ven. Chueh Fang and Ven. Miao Zhi also completed the reconstruction of the Lanyang Ren Ai Senior Citizen’s Home, with its opening held in September. Nan Tien Bridge, connecting Nan Tien Temple and Nan Tien Institute, was inaugurated in July after seventeen years. The Premier of New South Wales, Gladys Berejiklian, and Lord Mayor of Wollongong, Gordon Bradbery, attended the event, heralding a deeper exchange between East and West, and showed local government support for Buddhist-founded education. The “Truthful, Virtuous, and Beautiful Media Award,” founded by the Venerable Master Hsing Yun Public Education Trust Fund, celebrated its tenth anniversary this year. In November, the “10th Hsing Yun Truthful, Virtuous, and Beautiful Media Forum: Opportunities and Challenges of New Age Multimedia” was held by the commissioner of the award and founder of Global Views―Commonwealth Publishing Group, Professor Charles H.C. Kao. Past laureates Zhang Zuojin, Chen Charng-ven, Chai Song-Lin, Li Tao, Jennifer Shen, and Wang Chien-chuang gathered at Taipei Vihara to discuss the social values of the media, as well as the challenges and opportunities that come with globalization. In terms of propagating the Dharma through sports, our eight sports team have seen continuous victory under the leadership of President Lai Wei-Cheng of the Three Acts of Goodness Sports Association, Ven. Hui Zhi, and Ven. Hui Gong. For example, the Nanhua University Baseball Team, in its third year since its founding, became the youngest team in the history of Taiwanese baseball to compete in the Victory Baseball Cup Finals. The Pu-Men High School Girls Basketball Team won the High School Basketball League (HBL) championship for two consecutive years. The Pu-Men High School Baseball Team won the Aluminum Bat Division and runner-up in Wooden Bat Division of the High School Baseball League. Victories aside, the discipline, moral values, respect, and bearing shown by these athletes are changing the culture of sports, and now included as an educational goal in athletic training. This year, Buddha’s Light International Association (BLIA) members returned to Fo Guang Shan Headquarters to participate in the BLIA General Conference, showing how Humanistic Buddhism has flourished across the five continents. The theme of the conference, “Faith and Legacy,” is the hope that BLIA members continue the lineage of the Dharma by passing on their faith generation to generation. At the same time, I would thank everyone for their recognition in nominating me as the seventh BLIA President, as well as Liu Changle and Liu Chao-Ming as Deputy Presidents. Venerable Tzu Jung was appointed as Acting President, Wu Chih-yang as Legal Affairs Officer, C. Jim Chen as Treasurer, and Ven. Chueh Pei as Secretary General. We will continue to serve the members of BLIA, aspiring to work unitedly for the development of Humanistic Buddhism across the globe. In October, the Fifth World Buddhist Forum was held in Putian, Fujian Province, Mainland China with representatives from 55 countries and regions. I was invited to lead around 20 international representatives from Fo Guang Shan and delivered a keynote speech on behalf of Venerable Master. Our venerables also presented on the development of Humanistic Buddhism worldwide, receiving much feedback from fellow participants who praised Venerable Master’s vision and Fo Guang Shan’s groundbreaking efforts in the internationalization of Buddhism. Venerable Master believes that all magnanimous people understand the concept of equality. Therefore, if a person wishes to make themselves greater, they need to possess a mind of equality. In March, BLIA participated for the first time as a United Nations NGO in the 62nd Commission for the Status of Women (CSW62), represented by Ven. Chueh Pei, Ven. Yung Ku, Ven. Man Chien, Ven. Jue Cheng, and Ven. You Wang who shared how Venerable Master realizes the spirit of equality. Students from Nan Hua Temple Performing Arts Group, South Africa, also attended and discussed personal experiences about how their lives as village girls in Africa were transformed. In December, 2,000 members participated in the 2018 BLIA Chunghua Headquarters General Conference and elected Dr. Chao Yi as the new president; Sophia Hsieh, Ting Shou-chung, and Wu Chin-shun as Deputy Presidents; and Pan Wei-kang as Supervisor. The acceptance and recognition of Humanistic Buddhism by people around the world is the result of the efforts of both monastics and laity in spreading the Buddha’s compassion and wisdom. In January, in celebration of Dharma Day, which commemorates the awakening of the Buddha, over 2.5 million bowls of Laba Congee were distributed by the Executive Council and branch temples with the help of monastic and lay members. Beginning in 2014, Fo Guang Shan Monastery, Buddha Museum, and Zu Lai Temple in Brazil have been Winners of TripAdvisor Certificates of Excellence for five consecutive years, and are now listed in TripAdvisor’s Hall of Fame. The Buddha Museum was also featured in The New Zealand Herald, most circulated newspaper in New Zealand. Additionally, Pick it Up! : Chan Stories to Inspire published by Buddha’s Light Publications won a Bronze Living Now Evergreen Book Medal for Spiritual Leadership. Moreover, Beautiful Life Television (BLTV)’s 3D Animation I Love Happiness received its 13th award―the Colortape International Film Festival Top 10 Animation Award―and was also shortlisted for the 53rd Golden Bell Award for Best Animation. 110 years after scouting began in England and developed according to Christian values, the Buddha’s Light Scout Group became the first Buddhist Scouting group established in the UK, unprecedented in the country’s scouting history. This drew attention from The Guardian, BBC, and ITV, a historical milestone in terms of the development of Humanistic Buddhism in a multireligious Europe. In addition, Fo Guang Shan Buddhist Temple Christchurch received the 2018 Christchurch Street and Garden Award. FGS Miami received a proclamation from the Mayor to the City of Tamarac, Harry Dressler, declaring the month of May as Sakyamuni Buddha’s Birthday Month, and May 20th as Sakyamuni Buddha Thanksgiving Day. In November, Hsi Lai Temple celebrated its 30th Anniversary. Senator Ling Ling Chang, the first Taiwanese-American female US senator, and Senator Bob Archuleta, presented an American flag flown over the United States Capitol to the abbot, Ven. Hui Dong. It is the highest honor that commends Hsi Lai Temple’s contributions to American society. In December, 768 local temples and 3,478 deities gathered at the Buddha Museum for the When Buddha Meets the Gods Event, breaking the “Global Multireligious Reunion Attended by the Greatest Number of Deities in the World” world record, proving that religious harmony brings equality and goodness. As Fo Guang Shan enters its 53rd year, Venerable Master says, “In my life, there is no self. My life belongs to all. What matters is serving the multitude with an aspiring mind.” As long as we follow Venerable Master’s spirit of selflessness and practice the Five Precepts, Ten Wholesome Deeds, Six Paramitas, Four Means of Embracing, Three Acts of Goodness, and Four Givings, Humanistic Buddhism will shine in the world. Consequently, a Pure Land on Earth will be realized through the Five Harmonies: individual harmony achieved through joy, interpersonal harmony achieved through respect, family harmony achieved through deference, social harmony achieved through cooperation, and world harmony achieved through peace. May these words serve as encouragement to all. May everything you encounter be well-rounded and auspicious! 2019Copyright © BLTV. All rights reserved.